Senior Banquet 2018 Slideshow is here! A big thanks to Luba Neymit for all her hard work. If you would like to download the slideshow shown at the Music Boosters’ table at the 2018 Spring Concert, please click here. Congratulations to Studio Jazz for a brilliant performance at Essentially Ellington! Congratulations to Jazz A and Studio Jazz for wonderful performances at Swing Central! And a special congratulations to Studio Jazz for taking second place! Congratulations to Jazz A for first place at Newbury Park High Jazz Festival! The Agoura High School Studio Jazz Band was selected as one of the 15 nationwide finalists for Essentially Ellington, a May 10 competition sponsored by Jazz at Lincoln Center in New York. To be considered, each school submitted recordings of three tunes performed from the Jazz at Lincoln Center’s Essentially Ellington library. Besides having their recordings judged, the 15 finalists were selected through a screening process. In the May final competition, the Agoura band will present a set of music for a panel of judges. Chad Bloom is the AHS band director. Each finalist band will receive a workshop at their campus led by a professional musician before coming to New York to put up their “Dukes” and perform before jazz artist Wynton Marsalis and the judges. On May 10, the bands will arrive in New York City to spend three days in workshops, jam sessions, rehearsals and performances at Jazz at Lincoln Center. On May 12, the festival will conclude with a concert and awards ceremony featuring the three top-placing bands and the Jazz at Lincoln Center Orchestra with Marsalis. Festival events, including the final concert, will be webcast live on jazz.org/live. The festival is the culmination of the annual Essentially Ellington High School Jazz Band Program, which also includes regional festivals, teaching resources and a summer Band Director Academy. More than 4,600 high school bands are members of the 2017- 18 Essentially Ellington program. Also playing in All-State Ensembles were Vibiana Cardenas (viola), Nicholas Kim (clarinet) and Lauren Spring (trumpet). Congratulations to all our honored musicians! Choir I and Choir II performing with other LVUSD ensembles in the district choral festival on February 21, 2018. Congratulations to our Studio Jazz Band! The Marching Band brings some musical spirit to a basketball game! Photo credit to Phil Man, David Rosen, and Isabel Sol. Rhythm & Chews Festival and Fall Concert! Enjoy these great photos. Credit for these beautiful shots goes to Phil Man, David Rosen, and Isabel Sol. Our Spring Finale Concert was a fantastic evening of music from our Choirs, Wind Honors, Orchestra and Madrigals! Several of our seniors performed solos to close out their careers at AHS. Our apologies to any seniors that we did not photograph performing a solo. It was a great day (or should we say a Blue & Gold day?) for Agoura High at the Westlake Jazz Festival! Jazz B Blue won FIRST PLACE in the Intermediate Division! Jazz B Gold won FIRST PLACE in the Novice Division! The Agoura HS Studio/Jazz A Combo received Unanimous Superiors and 3rd place. Both big bands received UNANIMOUS SUPERIORS! Jazz B Blue was the only band in their division to receive this rating. There were many solo awards given to ALL of our soloists. MANY THANKS!! to Mr. Hackett and our assistant director Josh Jones for their contributions to our Jazz B groups this year! The Agoura High Choir at Disney Hall for the Los Angeles Master Chorale’s High School Choir Festival Day 2017! With LVUSD Superintendent Dan Stepenosky and Agoura High Principal Brian Mercer. Congratulations to Orchestra and Mr. Bloom for Winning the Grand Champion Award!! Congratulations to Mr. Bloom and Orchestra for earning an average score of 96.5 at the Performing Arts Consultants Big Apple Classic in New York. These amazing scores earned them a gold first place rating and the Grand Champion Award for best instrumental group! Jessica Kim was also honored as an outstanding soloist! We are so proud of our amazing orchestra students. Way to represent AHS Music!!!! Congratulations to Jazz A and Mr. Hackett for Winning 3rd Place at Savannah Swing Central Jazz!! Acclaimed trumpeter and music educator Terell Stafford visited Agoura High to work with our jazz ensembles. 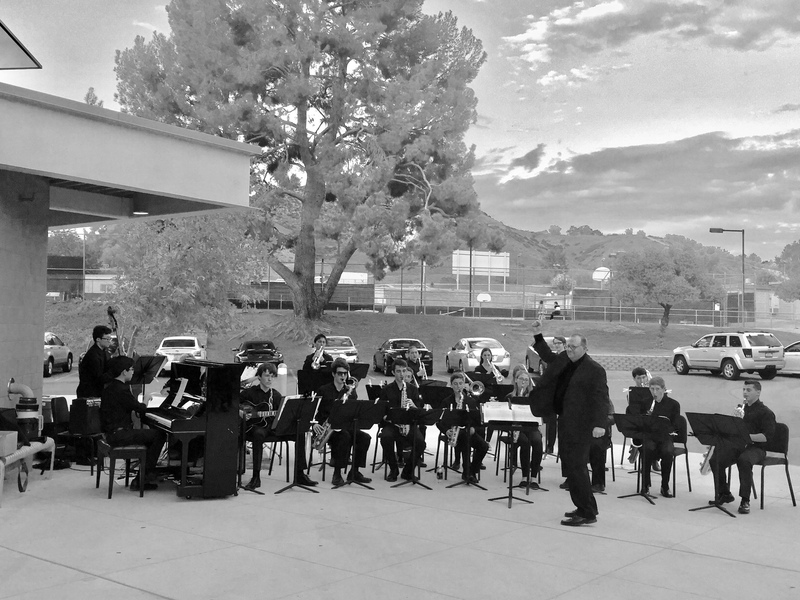 Mr. Stafford was also the star of our annual celebrity jazz concert with Calabasas High. Photo credit: Christine Boulgourjian, Elaine Fey, Margaret Geesen, Robert Hackett and Isabel Sol. Nick had help from many scouts and adult leaders of Troop 127, who not only worked hard on the project, but made generous financial contributions and gave advice that helped Nick execute his plan. Nick would like to especially acknowledge Mr. Peter Kraut, his Eagle project advisor; Mr. Robert Burns, his patrol mentor; Mr. Derek Povah, his door construction expert; and the Fritz family, who donated the carpet. Previous to Nick’s project, this room was used to store uniforms and choir robes. Newly spruced up room with sound-proof panels, custom door, new carpet and desk. All of our ensembles have been working hard and have had clinicians visit for extra instruction. The clinics our music students receive from renowned music educators and professionals are made possible by your donations and fundraising. Thank you parents! Studio Jazz working with Ronald Carter. Carl Allen, former Artistic Director of Jazz Studies at The Juilliard School, also recently conducted a clinic for our students. Ronald Carter and Mr. Bloom. The Fall Classical Concert was an outstanding evening filled with wonderful performances by the Wind Ensembles, Madrigals, Choirs, and Orchestras. Photo credit: Isabel Sol and Evelyn Jeong. Our first annual Rhythm & Chews Music and Food Festival was held on November 23. It was a great day of live music, food trucks, local artisans, vendors, and a silent auction. Thank you to our Co-Vice Presidents of Fundraising, Maureen Rouimi and Barbara Spring for devoting hours of work and months of planning to the success of this event! Photo credit: Isabel Sol and Evelyn Jeong. Agoura High School will kick off its inaugural Rhythm and Chews Festival this Sunday to raise funds for the school’s music program. The AHS music boosters is hosting the Oct. 23 festival at the school. According to booster club spokesperson Julie Paik, the music and food festival will feature ensembles from Agoura High, Cal State Northridge’s Jazz “A” band, the Equinox Jazz Ensemble and the Conejo Valley Community Jazz Band, directed by Matt McKagan, who is also the band director at Lindero Canyon Middle School. Among the many food trucks scheduled to sell food at the event are Cousins Maine Lobster and Pinch of Flavor. In addition to the music and food, a silent auction will be held, and local artisans and vendors will showcase their goods. Arts and crafts activities have been planned for children. To read the rest of this article, please go to The Acorn online. Our very busy Blue Crew represented Agoura High while marching in the 12th Annual Reyes Adobe Day Parade. Thank you to Mr. Hackett and the Blue Crew parent volunteers for their tireless efforts–especially parent coordinator, Rebecca Man. Photo credit: Isabel Sol and Rebecca Man. Each year, we welcome music students from LCMS and A.E. Wright to join the Blue Crew at an Agoura HIgh football game. The middle schoolers met Mr. Bloom and Mr. Hackett, rehearsed with the Blue Crew, had a pizza party, marched to the field and enjoyed a night of music and fun at the game versus Thousand Oaks High. Thank you to the many music parents who volunteered to help make Band Night 2016 a huge success! Photo credit: Maureen Rouimi and Isabel Sol. Mr. Hackett and our Blue Crew spent a wonderful day at the Rose Bowl for UCLA Band Day. High school marching bands from across Southern California performed at the UCLA vs. Stanford football game. Thank you to our chaperones for taking the day to spend with our students. Photo credit: Julie King, Rebecca Man, Maureen Rouimi and Isabel Sol. Video courtesy of Rebecca Man. As part of the summer renovations to the Agoura High music facilities (see panoramic photo in post below), senior Andrew Kraut made it his Eagle Scout project to replace 25 feet of cabinets with entirely new shelving tailored for the percussion section and to clean up the choir music library. The old cabinets were so dilapidated and unused that Mr. Bloom had torn out two doors as a temporary measure to make some of the space usable. To compliment the new and beautiful Wenger cabinets installed by LVUSD in J-2, Andrew’s team built seven foot tall shelves which they then covered in carpet to protect the percussion instruments from scratching and a locking cabinet per Mr. Bloom’s request. The team tackled the extremely cluttered choir music library by clearing out the room of what was mostly loose music. Clean up of choir room. Percussion instruments neatly stored in newly renovated shelving. Percussion storage area before renovation. They then took all the music (over 800 different pieces) and made a Google spreadsheet for cataloging the music. A random cabinet in the center of the choir room was removed and new music cabinets were installed where there used to be a marching band uniform closet with hangers. Andrew’s crew also took an unused shelf in the choir music library, fortified it and put it in the orchestral music library in order to make room for additional music. Andrew would like to acknowledge Mrs Rhonda Bacot for being his Eagle Scout project beneficiary, Mr. Robert Burns for being his project adviser, friend Jeremy Zacuto who was a non-scout volunteer and his team of fellow scouts, especially Connor Burns for creating the choir music catalog. BACK-TO-SCHOOL SNEAK PEAK: Take a look at the new and improved Band Room! Thank you to LVUSD for an amazing summer renovation to the AHS Music rooms, including all new storage cabinets, chairs and an amazing percussion storage. We would also like to thank senior Andrew Kraut for his effort on the percussion storage area and choir music organization as part of his Eagle Scout project. Photo credit: Mr. Bloom. Last week, AJ Holmes (most famously known for playing the role of the Elder Cunningham in the “Book of Mormon” on Broadway) taught a clinic to our choir students. AJ is a former Agoura High music student! AJ Holmes with Mr. Bloom and choir students. AJ Holmes working with student Chris Reilly. The final Agoura High Music Program concert of the year was a spectacular night of music from the movies, featuring Jazz B, Orchestras I and II and the three Wind Ensembles. Highlights included a performance of Beethoven’s Egmont Overture op. 84 by the Agoura High Symphony Orchestra (a combination of Orchestras I and II and members of Wind Ensemble Honors) and a performance of Star Wars Heroes by all three Wind Ensembles combined. A shout out of thanks to alumni Henry Bond and John Miller for speaking about the impact Agoura High Music has had on their lives and to Warren Wilson for rallying donations to help purchase new chimes! Photos by Hank Gifford, Phil Man and Isabel O. del Sol. Our choir students had the amazing opportunity to work with Lesley Leighton, Artistic Director of the Los Robles Master Chorale and sing in concert with the Los Robles Master Chorale and the Los Robles Children’s Choir. Enjoy these pieces by Eric Whitacre which tell of South Africa’s fight for freedom and equality. Studio Jazz and Jazz A were among 12 bands nationwide selected for the Savannah Swing Central Jazz competition held March 30 – April 1. In a testament to the incredible depth and quality of our program, Studio Jazz placed 2nd and Jazz A placed 4th! Savannah Swing Central Jazz is foremost a music education experience and besides competing, our students received clinics from renowned jazz professionals, participated in workshops, played on the riverfront and listened to professional concerts. A special thank you to Mr. Matt McKagan for filling in to lead Studio Jazz while Mr. Bloom was on paternity leave. Please enjoy these photos courtesy of Rachel McKagan and Isabel O. del Sol. Our annual Spring Concert was a great success even as we missed Mr. Bloom who was on paternity leave. LCMS music director Matt McKagan and retired AHS music director John Mosley stepped in to give Mr. Hackett a helping hand during an amazing night of music. Congratulations to Studio Jazz, Orchestra I, Orchestra II, Madrigals, Wind Ensemble I, Wind Ensemble II and Wind Honors for a job well-done. Photo credit: Phil Man and Elaine Fey. Earlier this month, a group of our wind ensemble students traveled to Chicago to participate in the Percy Grainger Wind Band Festival at the famed Chicago Symphony Center. It was an incredible educational experience where our students also received clinics from respected music educators, toured Northwestern University and the University of Chicago, ate Chicago-style deep dish pizza and saw the sights in Chicago. Enjoy these photos courtesy of Maureen Rouimi, Julie King, Marlene Cunningham and Matthew Jeong. Enjoy these great photos from the District Choir Festival held at Calabasas High this week. Music parent Phil Man donated his talent, time, and equipment—volunteers are what make the Music Boosters possible! Marcelo Lehninger, the esteemed Music Director of the New West Symphony, visited Agoura High to give a clinic to our orchestra students. Professional cellist Andrew Janss of the New West Symphony also participated in the clinic. Recently we hosted our annual Celebrity Jazz Concert — David Berger, formerly the arranger and conductor of Jazz at Lincoln Center and the legendary trumpeter Ron Stout led the Agoura High Studio Jazz and Jazz A Bands and Calabasas High Jazz A and Jazz B Bands in an incredible night of music. David Berger conducting Studio Jazz, accompanied by Ron Stout. Mr. Bloom with Studio Jazz and Sarah McKagan on vocals. Please join us in congratulating the following Agoura High music students. They auditioned for or were selected to participate in several prestigious honor groups or were designated as an award recipient. Congratulations to all of these amazing musicians! Yasmine Kasra playing in the CODA Honor String Orchestra. Olivia Geesen with Barb Catlin, Director of the SCSBOA Honor Jazz Band and her husband, professional trumpet player, Wayne Bergeron. Matt Kuperberg, Yasmine Kasra, Cameron Kissler, Lauren Spring, Nathan Fey, Nick DeLaurentis, Chris Reilly, Olivia Geesen, and Emily Fogel. 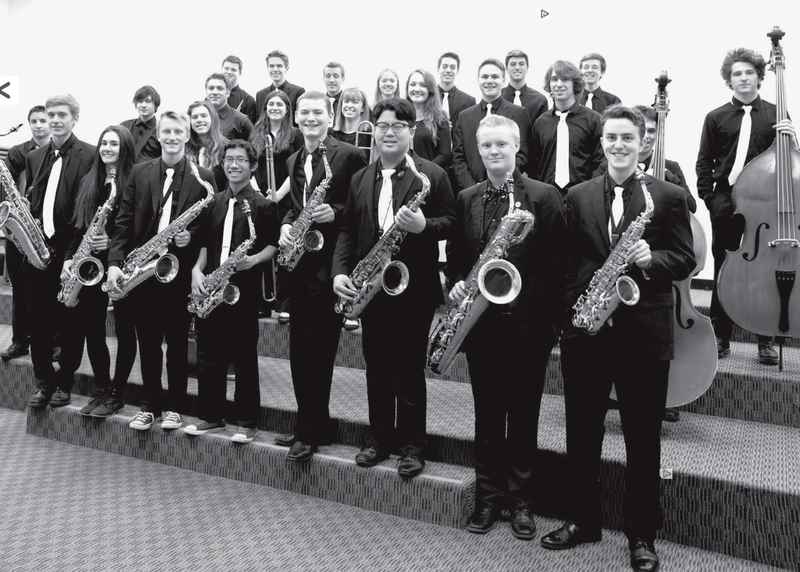 Agoura and Calabasas high schools will host a joint Celebrity Jazz Concert on Sat., Feb. 20. The performance will feature Jazz at Lincoln Center’s David Berger, Los Angeles-based trumpeter Ron Stout and bands from both schools. To read the rest of this article please go to the Acorn online. A clinic with a music educator or professional musician is one of the ways Agoura students receive a first-rate music education. Without your donations, visits by clinicians would not be possible. Renowned jazz artist Bryan Carter taught a drummer/rhythm section clinic for our drum set players that was geared towards the role of the drummer in a combo and a big band and the technique required. Also, on January 12, a percussion clinic was held in the PAEC by the Chapman University Percussion Ensemble. Enjoy the photos! Enjoy these pictures from the recent Winter Jazz Concert featuring Studio Jazz, Jazz A and Jazz B as well as special guest artist, saxophonist George Young. Mr. Young has been a professional musician and composer for over 70 years! The finalists for Swing Central Jazz were recently announced and Studio Jazz and Jazz A were among the twelve bands selected nationwide. During the fall, our students worked hard to master the required music and submitted audition recordings. Both bands have qualified for the final round several times and last year, Studio Jazz won the competition for the fourth year in a row. For more information, please visit the Swing Central Jazz website. Retired Music Director John Mosley built Agoura High Music into a nationally recognized program during the 30 plus years he devoted to our students. The effort to name the Agoura PAEC Orchestra Pit in his honor is only $700 short of its goal. Help us to bring lasting recognition to this incredible music educator! Donations can be made using the link or the form below, but please NOTE in the comments box or on the pledge form that your donation is to go directly to the Mosley Orchestra Pit dedication. The concert on September 30 was an amazing night of jazz performances by our talented students. Photo credit to Elaine Fey. The Blue Crew entertained the local community marching in the 11th Annual Reyes Adobes Day Parade. Principal Brian Mercer led the way down the parade route. Thank you to our parent volunteers: Antasha Lange, Rebecca Man, Jenni Martinez, Barbara Spring, Lori Kananack. and Sharon Neiyer. Congratulations to the Marching Band for their debut performance at the first football game versus Ventura High School. Thank you to our parent volunteers and Marching Band Coordinator, Rebecca Man. Photo credit: Phil Man. 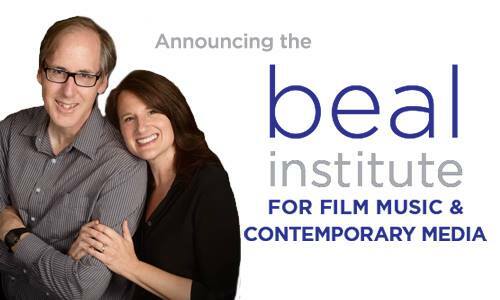 Jeff Beal and Joan Shapiro Beal have made a $2 million commitment to the Eastman School of Music that will launch the Beal Institute for Film Music & Contemporary Media. The Beals are former Music Booster parents (Henry Beal, Class of 2013) and we are proud to call them family. For more information about this amazing and generous gift, read the press release on the Eastman School of Music website.